1) Ingredients must all come from a single location. Exceptions can be made for water, small amounts of salt, pepper, oil, and commonly-available, inexpensive dried spices. 2) Ingredients purchased must come in under a certain budget (I chose $10.00 before tax). 3) The meal should feed at least four adults. 4) There must be some actual cooking involved. 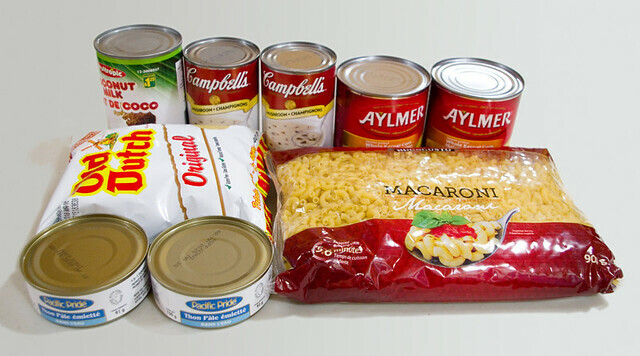 You may combine ingredients from instant meals or canned goods, but they can’t be served as-is with no changes. 5) The meal should be as healthy as possible; it should not be able to be mistaken for a dessert. There is a lot of food available at the local Dollarama, but most of it is junk food. Chips, candy, chocolate, soft drinks, that kind of thing. 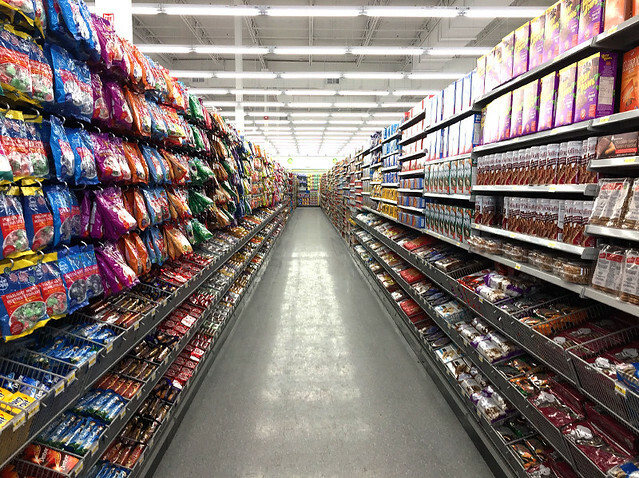 There is a small section near the back of regular food, but nothing is perishable. I wanted to include some fruit and/or veggies in the meal, and preferably a bit of meat if possible, so that narrowed my choices even further. I was tempted to make spaghetti with tomato sauce (there was both pre-made spaghetti sauce and canned tomatoes, tomato paste, and Italian spice mix), or canned soup/stew with Bisquick dumplings, or pancakes with canned fruit (there was pancake mix, coconut milk to replace cow’s milk, canola oil and applesauce to replace the eggs, and a couple of kinds of canned fruit as the topping). However, I finally decided on a tuna noodle casserole. I was very happy with the end result, which I based on the Campbell’s® Tuna Noodle Casserole from Allrecipes.com. Of course, I had to make changes for the available ingredients, but I had to start somewhere. For example, I replaced milk with coconut milk, frozen peas with canned corn, egg noodles with macaroni, and the dry bread crumb and butter topping with plain crushed potato chips. Even so, it worked really well! 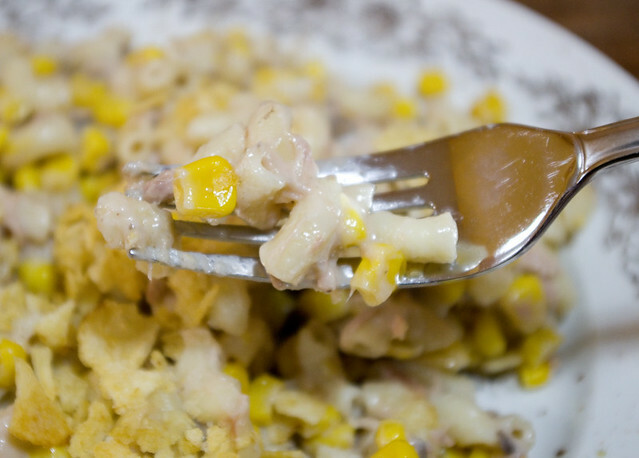 I think that I will probably make this recipe again, but not in challenge-mode, so that I can use frozen corn instead of canned since I greatly prefer the taste of frozen. 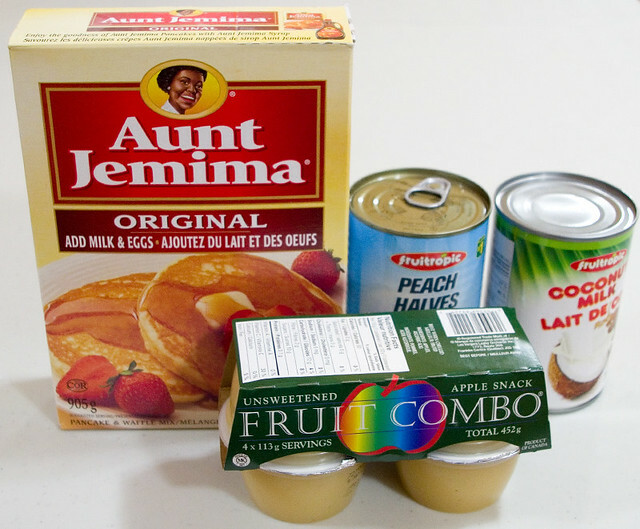 As a bonus, it’s a great meal for camping (cooked in a pot instead of baked), cottaging, or when trying to clean out the pantry, since all of the ingredients are non-perishable. And at $2.21 a head (assuming it serves the minimum four people), it’s pretty darned affordable. Out of challenge mode, with a bit of bargain shopping at the supermarket, it could be made even cheaper. Around here, I know that cans of cream of mushroom soup often go on sale for $0.50 each, coconut milk is about $0.98, a big bag of frozen corn often costs about $2.00, and dried noodles sometimes go on sale for less than $1.00 a bag. This is all assuming you don’t buy the big name-brand version stuff, of course. Turn the burner down to medium-high. Cook the pasta until it is al dente. Drain the pasta and set aside. Mix well. Add the drained pasta to the sauce mixture, stirring well to evenly distribute the ingredients. Put casserole into the oven uncovered. 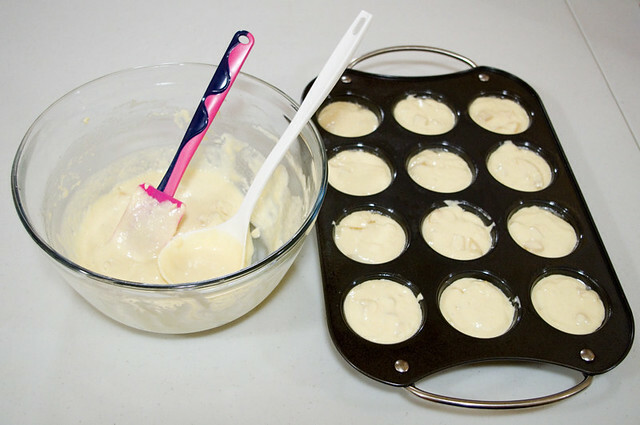 Bake for 30 minutes or until warmed through**. Stir the casserole. 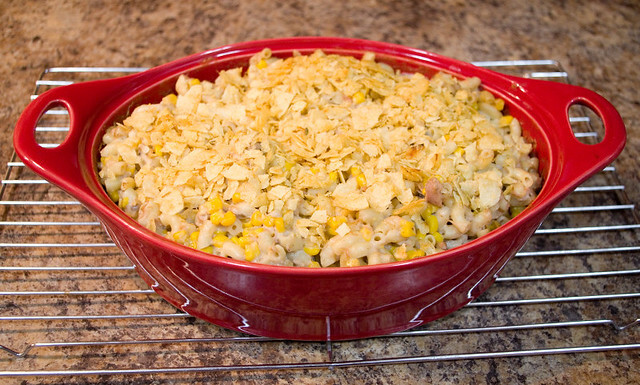 Sprinkle the crushed chips onto the top of the casserole and bake for an additional 5 minutes. Remove from oven and serve. **If you are cooking this on the stove, heat mixture gently in a pot until it is warmed through and sauce is slightly thickened. 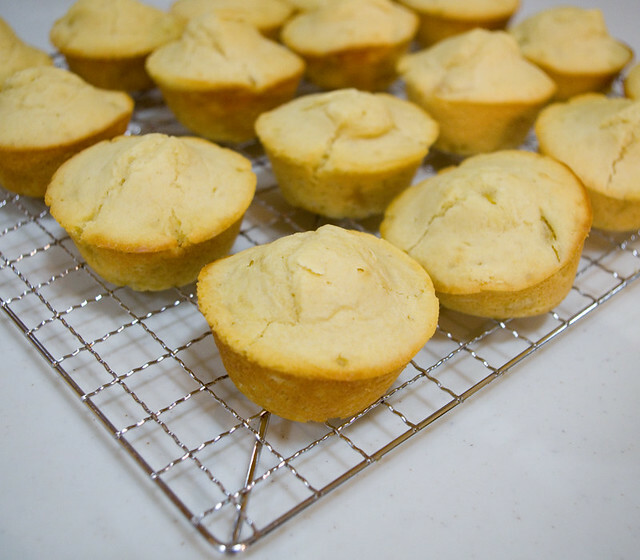 Skip the next baking step, and instead garnish each individual serving with a sprinkling of crushed potato chips. I’m decorating for my Halloween party this coming weekend, and I dug out a bunch of crafts I’d done from previous years in the process. One of the ones I’m most fond of is the spooky glowing skulls that I made using Epbot’s tutorial. Epbot always has great (and inexpensive) Halloween crafts, along with detailed instructions and photographs. 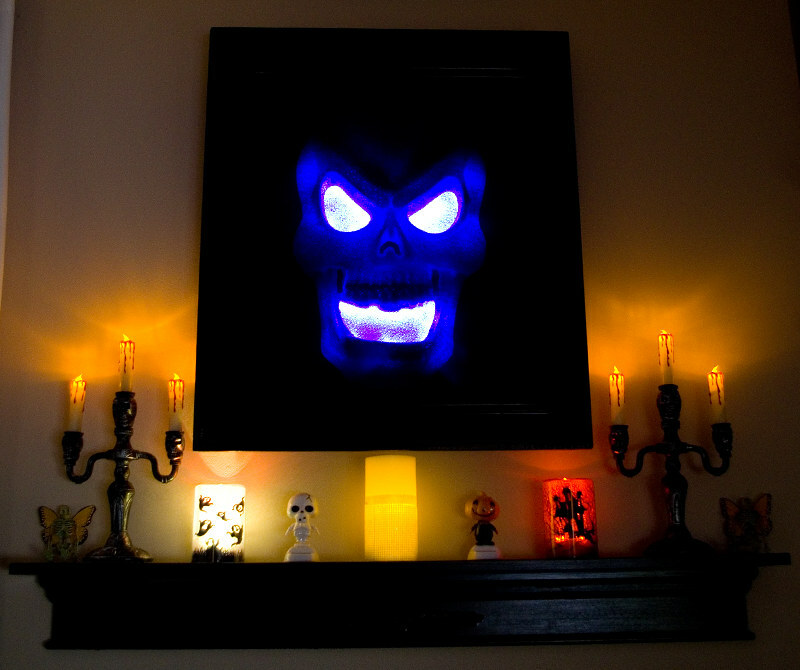 I really want to make some DIY skull sconces, but I doubt I’ll have time before the party. Maybe next year? I think my biggest challenge to making these glowing skulls was finding the proper materials. Epbot is based in the States, and we just have a totally different range of dollar store craft supplies than they do down there. I couldn’t find a sturdy enough frame with a fancy border; there were lots of fake photo frames for Halloween, but they were such cheap plastic that they bent with the slightest pressure from the fabric. I ended up using IKEA RIBBA 8″x10″ frames. 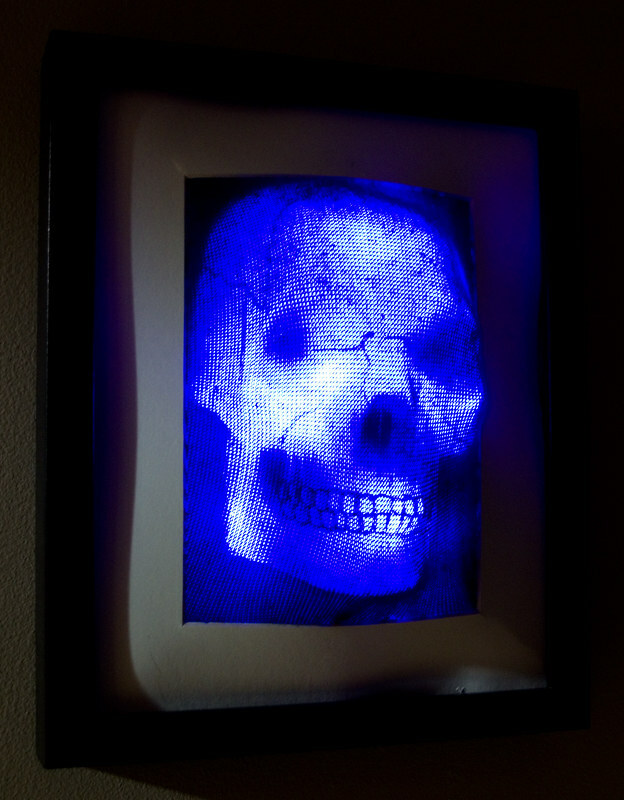 With the matting and simple wooden frames, my glowing skulls didn’t really look all that much like the ones from the tutorial, but I think that they worked out okay. They actually go pretty well in my house because I use RIBBA frames all over the place for day-to-day picture framing anyway, so the skulls kind of fit in. I enjoyed making the small skulls so much that I stepped up my game with a huge foam skull (I couldn’t find a translucent plastic one that size), fabric from the fabric store, and a freebie second-hand frame that I spray-painted black. The skull already had lights, but I didn’t like the colour or placement, so I ripped them out and started fresh with a brand new blue string. 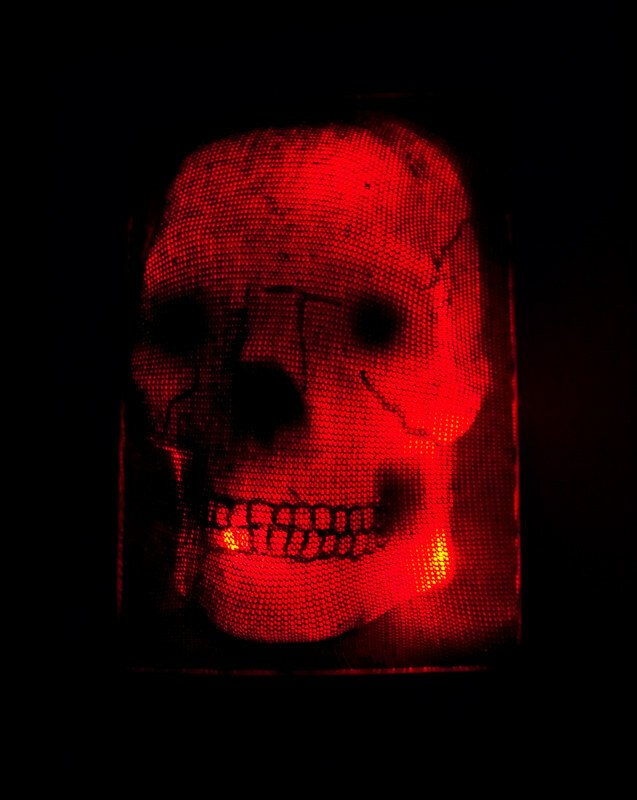 I think this is my favourite of all of the glowing skulls I made; it’s definitely the most striking. It kind of reminds me of the Evil Queen’s mirror crossed with the old Frighteners movie poster.